An early goal put high-flying visitors Weymouth on course for a 2-1 at Biggleswade Town on Saturday. The Southern League Premier’s third place side made the perect start on three minutes when Thiago Caze da Silva headed home his debut goal. However the Waders were causing problems, Liam Brooks firing wide after nine minutes, before Jack Bowen missed with a header. The hosts enjoyed a lot of first half possession without really troubling the visitors’ goal. And they paid for this late on in the first half when Brandon Goodship lobbed Liam Gooch to make it 2-0 at the interval. In the second half the Waders once again enjoyed a lot of the ball and they pulled a goal back with 12 minutes to go. 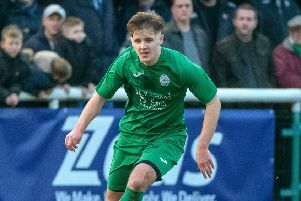 After Brooks’ effort was well saved, Craig Daniel swung in the resulting corner and the ball was stabbed home, going down as as an own goal by the keeper William Dennis. It was then game on for an equaliser.Robbie Parker and Daniel both had late opportunities but the visitors held on for all three points. Tuesday’s match against Hereford was postponed after the Carlsberg Stadium pitch failed a morning inspection. Waders are on the road this weekend when they travel to Tiverton.